If you could pinpoint the moment that began the wind farm construction boom responsible for South Australia’s status as a global renewable energy powerhouse, it might well be when Michael Vawser decided to fly halfway across the world in search of maps. The year was 1999 and Michael Vawser was based out of Bristol in the UK, working as an engineering manager for a tiny renewable energy firm called Wind Prospect. This story was originally published in CityMag Issue 12 alongside a Small Business Survey featuring three other local players in the renewable energy space – Zen Energy, Tindo Solar and Consolidated Power Projects. Michael attempted to convince the company, which was only a couple of years old and still finding its feet in England, to try building a wind energy industry from scratch way over on the other side of the planet. He said they should tap the small and distant market of South Australia, which at the time was home to a solitary wind turbine in Coober Pedy and no real regulatory support for the sector. What it did have, the Adelaide-born-and-raised Michael told his bosses, was lots and lots of wind. Company founders Euan Cameron and Colin Palmer took some persuading – wind isn’t exactly a rare commodity – but they had a bit of faith in Michael, who was enlisted as Wind Prospect’s first employee after an internship in 1997. The pair decided to give it a shot, and the South Australian soon found himself on the first of several trips back home to Adelaide, tasked with a mission of surveying the lay of the land. “What I ended up doing was buying a lot of topographic maps of South Australia,” he says. The next step was identifying the people who owned land that looked promising, a process made easier by South Australia’s comprehensive land ownership online databases – an unremarkable service by 2015 standards but well ahead of the game in 1999, and a crucial head start for the local wind energy sector. Michael met landowners and gathered anecdotal evidence about the windiness of their properties, in between making his own observations about how far trees were bending in the breeze and checking out the data gathered by local meteorological towers. Over a couple of visits he signed up landowners across a number of sites. The addition of committed investors meant that in 2000 head office decided to create a new Australian entity, with Michael appointed as managing director and Adelaide chosen as the base of operations. The move into Australia was partially a gamble by a company, which – at that early stage – could only talk of the possibility the Howard Government would introduce an industry-stimulating Renewable Energy Target (RET). Fortunately for Michael, the target was made a reality the very next year. “It was a good time to speculate,” he says. In those early years, staff turnover was high and selling the pitch to landowners was challenging because nobody had really tried this kind of thing in Australia. The widespread rollout of wind turbines was seen as the daydreaming of environmental activists rather than a serious business proposal. Nevertheless, some were convinced, and progress gained pace with two of the first four sites identified going ahead to construction. Twenty-three turbines with up to 46 megawatts (MW) capacity were installed in the South East to create Canunda Wind Farm, and the 35 turbine, 70 MW Mount Millar Wind Farm was set up on the Eyre Peninsula. The widespread rollout of wind turbines was seen as the daydreaming of environmental activists rather than a serious business proposal. Once those projects got going, the sales pitch became vastly easier and things got very competitive indeed. South Australia entered something akin to a gold rush, except instead of rival prospectors panning in rivers for precious metals, they were racing each other to the front gates of people living in windy locales. Mike Middleton, who joined Wind Prospect in 2004 as an operations engineer and now works as an energy resource manager, was on the front lines assessing prospective sites. “You’d start by chatting to landowners to get a feel – they often had stories about getting blown off hills and car doors slamming on them, but just about everyone I met seemed to think their place was the windiest spot in the world,” he says. Because Bureau of Meteorology weather stations – which are often located in towns and too short to be that helpful – couldn’t relate the full picture, the team would then seek land owners’ permission to install meteorological masts up to 100m tall that were capable of determining wind speed at various altitudes. If the results indicated a gale that could be turned into a profitable amount of energy and the land was reasonably close to the electricity grid, an environmental impact statement would then be conducted – a process at which Wind Prospect excel. The company has a 100 per cent approval rate in Australia, having developed a rigorous approach born out of strict UK conservation laws. Finally, larger companies better equipped to carry out construction would come into play and more or less take it from there. After applying this procedure countless times in the more than 16 years since they were established, Wind Prospect’s tallies are impressive. It has played a central role in the construction or approval of 13 South Australian wind farm projects, mostly in and around the Mid North region of the state. Their most recent local development, the expansive Snowtown Wind Farm which can generate up to 270MW via 138 turbines, exemplifies how flexibility and adaptation have been key to success in the ever-evolving industry. The farm was developed in partnership with New Zealand company Trustpower as their first project in Australia. 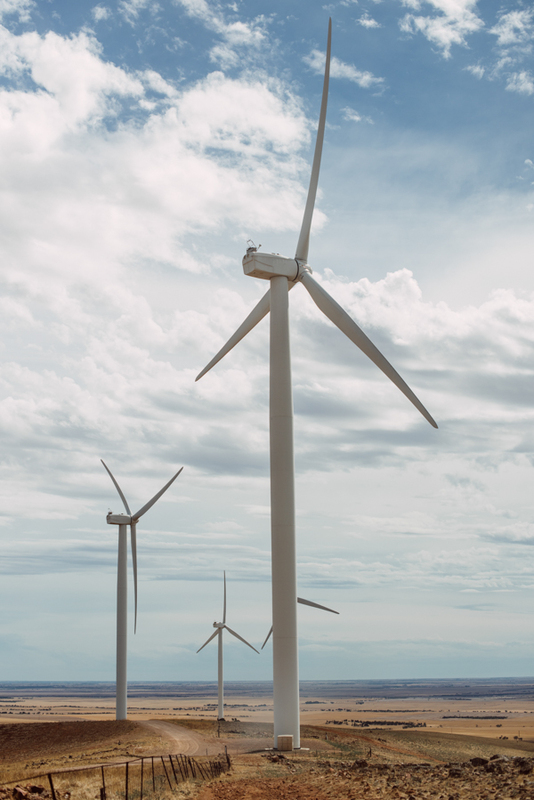 Trustpower’s wind development manager – Rontheo Vanzyl – revealed that the alliance came about when the two companies signed up neighbouring landowners around the same site. But turning potential competition into collaboration and overcoming the initially foreign nature of wind energy are not the only speed bumps Wind Prospect has faced in carving out this new industry. The notoriously fickle Australian regulatory environment came into play early in the game. The first setback was in 2004 when the State Government placed a moratorium on new wind farm development predicated on the basis that the impact of so many new projects needed to be assessed before proceeding further. In 2005, the brakes were lifted after everything checked out, and a frenetic half decade of new developments commenced. Since the moratorium was lifted, the political environment around wind farms has presented fewer problems at a state level. Michael attributes “the golden years” of SA wind energy to a relative lack of bureaucracy when compared to eastern seaboard regimes, more straightforward development paths, and plenty of cheerleading from state leaders. “[Former Premier] Mike Rann and following him [his successor] Jay Weatherill would appear in the press a lot talking up wind farms, and that makes a massive difference in convincing investors,” he says. There was also a sympathetic Federal Government during the Rudd-Gillard years, but the appointment of a new leader of the Opposition signalled to Michael that the good times were about to come to an end. “When Tony Abbott became Opposition leader in 2009, from that point on we started getting the jitters about what was going to happen,” he says. Even so, with a senate inquiry into wind farms going ahead, a reduction in the RET and a (since-lifted) ban on the Clean Energy Finance Corporation making wind farm investments, plenty of damage was inflicted. Michael describes the market sentiment for new wind farms as “very, very poor” since 2013. Even Wind Prospect group’s head office in Bristol immediately noticed the halt in Australian momentum. Founder and current CEO Euan Cameron said that setting up shop in Australia was one of the company’s best moves, but that the change of Federal Government had a huge impact on the entire renewables industry in Australia, and that “everyone has been treading water” since. Globally, the Wind Prospect group employs over 200 people in 24 offices across Europe, Africa and the Asia Pacific region, working on operation roles as well as development. Wind Prospect Australia has, in total, secured planning approval for 18 wind farms and one solar farm totalling more than 2,600 MW, of which 951MW is already operating or under construction. But, the recent downturn in Australian activity saw staff numbers here plummet from around 40 to just five, while a further ten staff remain employed as part of a joint venture team operating in New South Wales. Still, Michael is cautiously optimistic and says he is pleased with the more positive language coming out of Canberra since Prime Minister Malcolm Turnbull grabbed the reins of power. He is, however, awaiting tangible changes in policy. Even if things pick up for renewables nationwide, that doesn’t mean Wind Prospect will be churning out more wind farms in South Australia. Adelaide remains the base of operations, but the company’s potential projects are all interstate and overseas – New South Wales, Victoria, Queensland, Western Australia and the Philippines. Michael attributed the lack of local action to the fact SA is so much further developed than neighbouring states, meaning there is less scope for growth. He says that even before federal political machinations slowed progress, the company was looking further afield. He singled out the massive 514MW Waddi wind farm proposal in Western Australia and the 319MW Sapphire Wind Farm in New South Wales as two particularly promising options for the year ahead. If they work out, then clearly in more ways than one, this is a company with a special knack for working out which way the wind is blowing.